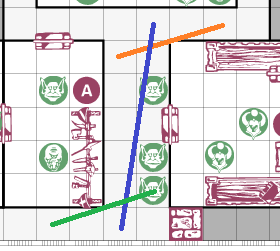 As described in my visibility post, my rules interpretation uses two kinds of visibility – visibility within a room, and line of sight. Because of the anti door camping rule, line of sight is only used for corridors… But even with this narrow scope, it’s still important! My first attempt at line of sight was to implement ray casting in a circle. I cast rays in degree increments (such as PI/16) from 0 to 2*PI. For each ray, I step the line in increments such as dX = cos(theta) * scale, dY = sin(theta) * scale. The scale factor can be adjusted. Each time a step results in a new square space, I check if visibility is blocked. For an orthogonal step, the check is simple. For a diagonal step, I used the same implementation as described in my diagonal attacks post. This first pass worked reasonable well. However, I had some concerns… The performance wasn’t really an issue (except as a theoretical exercise), but it’s worth mention that depending on your degree increment (such as PI/16), my algorithm was doing a lot of redundant checks. The bigger concern I had was that the results didn’t exactly match the definition of line of sight that I wanted to use. Here are some examples where I ended up having more squares be visible than I wanted. The results are pretty good, but it doesn’t strictly match the desired line of sight definition. 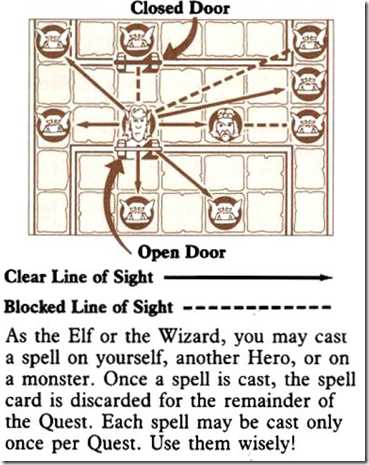 The official game rules clearly define (albeit with the language “Rule of Thumb”) a definition of line of sight - to see a square, you need to draw an unobstructed line from source square center to destination square center. An astute observer will notice two strange things about the game’s one line of sight diagram. It shows a two-wide horizontal corridor (or maybe the board is rotated 90 degrees?). 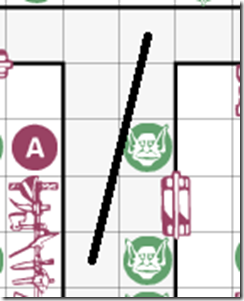 And the Elf’s right-side diagonal visible line crosses through the Wizard. The rules probably mean it as an example of “touches a corner”. The following similar example shows a line going through a goblin’s square. The example is different than a 45 degree line that literally just “touches a corner” in the most minimal sense. Casting rays in a circle by a fixed angle of increments doesn’t do that. The rays are cast in a direction based on an angle (by a constant angle increment about a circle). This is different than casting a ray towards a destination square’s center. So instead of casting rays in angle increments, I moved on to an implementation that literally casts rays to target square centers. The board only has 26*19 = 494 total squares, so simply casting rays to every single square on the board doesn’t seem that significant – because we only do it once after each move. If we assume monsters don’t affect visibility, then it might make sense for each square to have a list of visible squares that is generated on map load. Then we only need to update when something happens that affects visibility changes (eg a falling black trap is sprung). If we include monsters, then we’d have to update relevant squares in our per-square visibility list whenever a monster moves (or dies). Regardless of whether we maintain a per-square visibility list, we can reduce the number of target squares to check (for a given source square). But one aspect we need to consider is how drastically the board can change. Room placement can change due to expansion tiles. 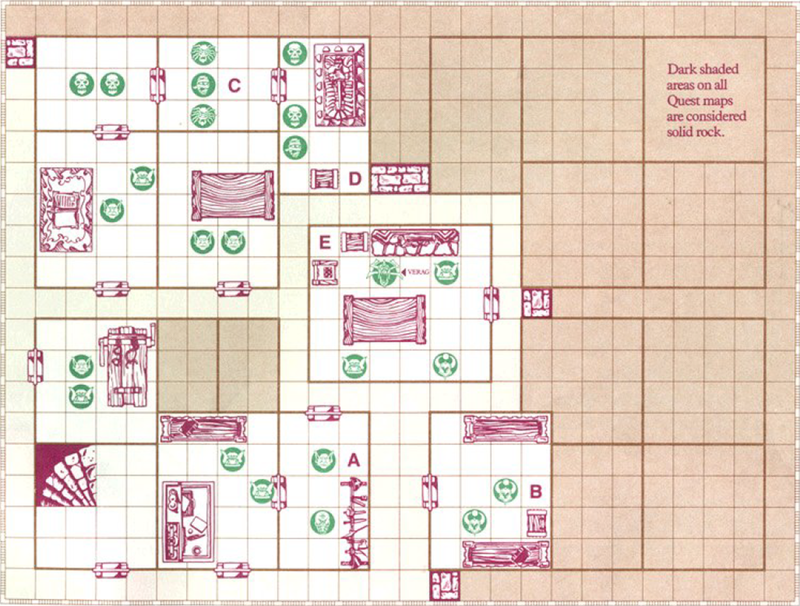 But none of the official maps (or official tiles) change corridors in a way that’s relevant. Another idea is to take advantage of our particular rules interpretation. For revealing a room, opening a door (or entering a room via “Pass Through Rock”) reveals the entire room. Miniatures in the same room are always visible (for casting spells and ranged attacks). With the anti door camping rule, we don’t allow seeing into other rooms for casting spells and ranged attacks. Orthogonal squares can be handled by four simple ray casts, so let’s set these aside. In the following examples, I counted how many non-orthogonal non-room squares are (within 3 dX and 6 dY). The first has 11, the second has 14. If we want to support custom maps with weird corridors, an easy way to extend this idea is just to include a wider bounding box than (3 dX, 6 dY). One more easy trick – we can exclude squares marked as “dark”. In summary… Cast four orthogonal rays (East, North, West, South). 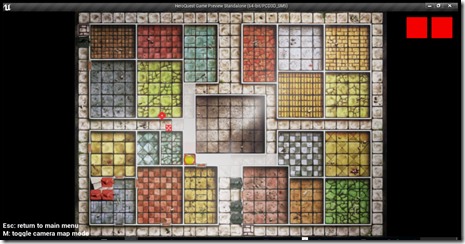 Cast rays to target square centers for squares that meet the following criteria – not part of a room, not a dark square, within 3 dX and 6 dY. One case I had to debug was that with a Hero at (10, 18), I was seeing (12, 17) as visible. I did expect to see (13, 17) as visible because a straight line goes to its center. But a straight line from (10, 18) to (12, 17) is blocked by a wall. The issue was that my algorithm was marking squares on the way to the target as visible. In this example, when I cast a ray from (10, 18) to (13, 17), we travelled through (12, 17). However, (12, 17) is not visible. So I modified my code to only mark the target square as visible. I ran into an interesting corner case with my implementation. I got the following values. In this example, we were checking for line of sight from (1, 18) to (0, 17). Using the bit mask from my diagonal attacks post, this is a valid case (0110). However, because my (dx dy) step is so small, we ended up visiting (1, 17). Going from (1, 18) to (1, 17) is an orthogonal move though a wall – so it’s blocked. This is the special case – "even if the line just touches a corner". As a work-around, I simply skipped over these cases where the fractional part was 0.5. I’ll close with a video showing line of sight used for reveal of corridors. The video has white highlight squares that I used for debugging – I intentionally left these in the video to show what squares are being marked as visible. The video shows some small quirks. The orthogonal rays include room squares while the diagonal rays do not. The double block only blocks one square instead of both squares. I will do more tweaking, but overall it does the intended functionality – so I decided to post the video. Fun stuff! I was thinking about the game’s “touches a corner” example and how my square center to square center algorithm differs. Here’s another idea on how to handle it. There’s a small finite number of slopes in our taxicab geometry board with one-wide and two-wide corridors. Because each quadrant (or octant) has symmetry, we can also divide this by four (or by eight). 1/2 can hold one list for (1 2) (-1 2) (1 –2) (-1 –2) (2 1) (-2 1) (2 –1) (-2 –1) because of the symmetry. Also, (1 2) is the same as (2 4). because walking (2 4) is just walking (1 4) twice. For each of these diagonal line slopes, we could simply hardcode which squares to check for obstruction. With 3 dx 6 dy, the slopes in an octant are 1/2, 1/3, 1/4, 1/5, 1/6, 2/3, 2/5, 3/4, 3/5. That’s only 9 total. My current implementation of a ray cast takes tiny floating point steps and rounds to the nearest integer. Instead of using floating point increments, we could walk a ray slope’s list of squares. Consider the official example where the line touches the corner of the wizard’s square. This example is 1/4 (dx = 4, dy = 1). For 1/4, the list would be (x y) of (1 0) (3 1) (4 1). Notice that we skip both (2 0) and (2 1). This means if there is a wizard on both (2 0) and (2 1) then it would not obstruct. But what if there is a block on both (2 0) and (2 1)? Obviously a block on both (2 0) and (2 1) obstructs both reveal vision and spell vision. So we’ll need some additional logic to differentiate between miniatures and blocks. HeroQuest takes place on a 26×19 size board. So even with custom maps that intentionally use wide corridors, or even an entire map that’s just a 26×19 corridor, there’s a limited number of slopes. If we want to support a 26×19 corridor, we could just have more lists. I’d have to check how many lists we’d need (and how tedious it would be to create those lists manually). Another idea is to determine whether a square is included in a ray cast based on the “area”. When a ray is cast through a square, it cuts the square into two pieces. Another idea is to inscribe a circle inside the square, and check whether the ray intersects that circle. That will give slightly different results (than area) for very steep angles. The results of each algorithm give slightly different results. The results we prefer depends on our game design choices. The algorithm I implemented for the above video includes any square that is touched by the ray – except corners touched at (0.5, 0.5) by 45 degree lines. For now I’m sticking with that, but I may revise it later. 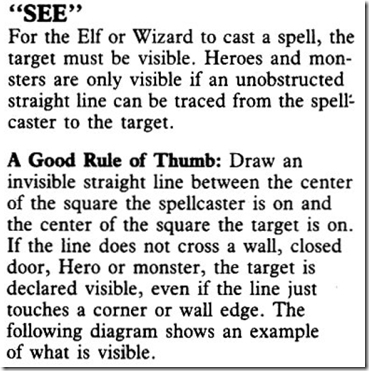 My previous post discussed my rules interpretation for visibility (what a Hero can “SEE”). I implemented the reveal rooms portion. Initially, only the room(s) with (a) hero(es) is/are visible. A hero can now open closed doors. Opening a closed door reveals the room. In the video, you’ll notice that as the hero walks through a corridor, nothing gets revealed. This is because I did not yet implement a line of sight algorithm. Probably what I will implement is ray casting between square centers that checks for obstructions (blocks and walls). For now, here’s my latest video. 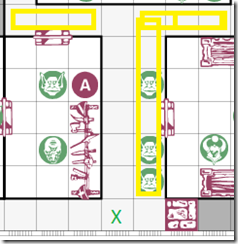 It’s the first quest with some extra doors to make it easier for the hero to walk around and reveal each room. I have a childhood memory (I think it really happened!) 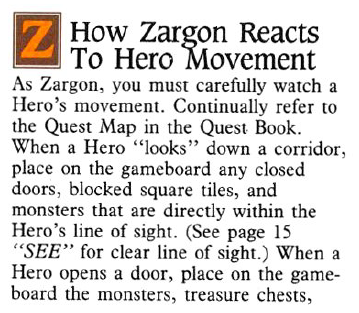 that when I first tried HeroQuest with my father, without really reading the rule book, I opened the quest book and setup the entire board for the first quest. On Zargon’s turn, he had a lot of monsters to move! 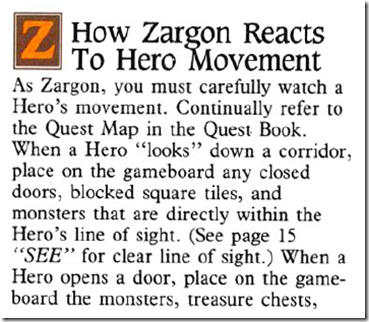 I had also assumed the game was competitive (it’s not – Zargon is more like an AI or DM). That could be a fun scenario, though I think we’d want some sort of anti-camping to prevent a stalement (eg if no heroes do any actions for 10 turns then they lose) (eg every so many turns, more monsters spawn). Of course it turned out to be a mistake. The map is designed to get revealed as the heroes explore the board, so you only see one new room at a time. The rules are ambiguous in terms of what it means to “see”, and there’s differences in the European versus American rules. The American rulebook is newer and longer, but I also like to reference the European version as another data point (and the expansions). In some cases, there’s not a clear answer, so I try to pick the most reasonable interpretation in terms of game design. There’s also different types of “seeing” (of “visibility”) – revealing, casting spells, ranged attacking, searching for treasure, searching for traps, and searching for secret doors. Abstractly, the two types of seeing are rooms and line of sight. For example, you can attack a monster in a different room (through an open door), but when you search for treasure it only applies to the room you’re in (and you can’t search for treasure in corridors). For corridors, revealing is based on line of sight. But what about casting spells in a room? 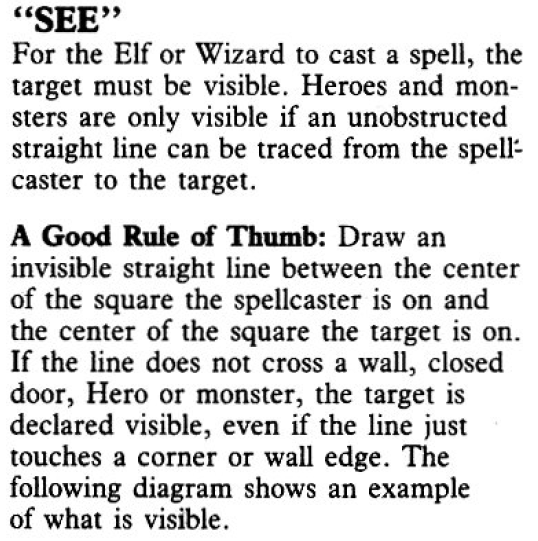 In the previous section, I used the word “reveal”, but the rules only uses the words “see” and “visible” – this suggests you reveal a monster that’s “visible” and you can also cast spells on a monster that’s “visible”. The European instructions explicitly states this. So which version should we use? 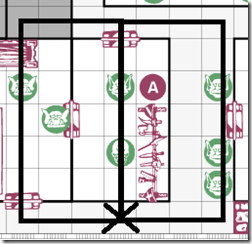 Can you cast a spell on miniatures in the same room, or do you need unobstructed line of sight? I like the European version and it’s not clear to me whether the American rule book intentionally made this rule change – it might have been an oversight. The above (pg-15) American example has an Elf in a corridor – they don’t show any examples of line of sight with a hero in a room. 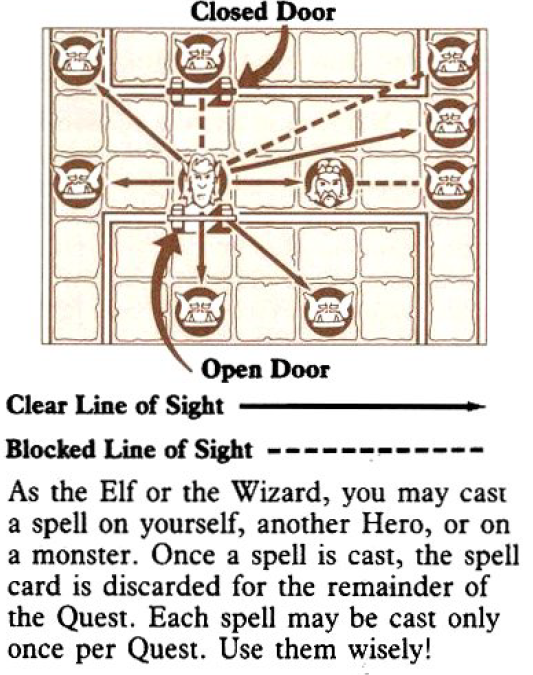 It’s not clearly communicated, but I think the most literal interpretation of the American rules is that you need unobstructed line of sight to cast a spell (and probably for a ranged attack too) (obstructions include walls, closed doors, and heroes/monsters). My current design decision is to use the European version – if it’s in the same room as you, then you can see it. If it’s not, then use unobstructed line of sight from the caster’s square center to the target’s square center (if the line just touches a corner or wall edge that doesn’t obstruct visibility). The European version says ranged attacks are the same as spells – so I’m applying the same visibility rules to ranged attacks as spells. This one is easy. You can’t search for treasure in corridors. In rooms, you can only search your current room. The most obvious part of how to interpret this is – if you’re in a room, your search includes the room you are in. 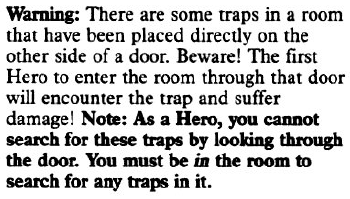 The American version gives us a further clarification that when you search a room/corridor for traps (and I’m interpolating this means secret doors too), you only search that room/corridor – even if an open door is in your line of sight. But when you search a corridor, exactly which squares do you search? What does “whole room or passage” mean? What does “corridor that you are in” mean? Line of sight is a reasonable answer. 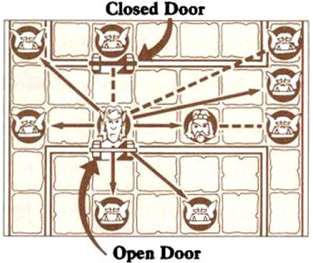 A more inclusive answer would be any square that’s already been revealed that your hero can access by normal walking without going through a door/room. An interesting corner case is that corridors have walls – and these walls can have a door or a secret door. When walking in a corridor, is a door revealed when you have line of sight to the door’s square center, or to the door itself (such as the wall’s middle point or maybe its two endpoints)? The same question applies to searching a corridor for secret door. I’ve chosen to take a liberal interpretation on this one – line of sight to the wall’s square’s center. 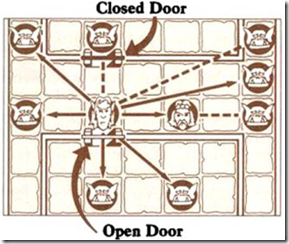 In the following example, when the Elf opens the door – the entire room is revealed. That includes the two corner mummies. 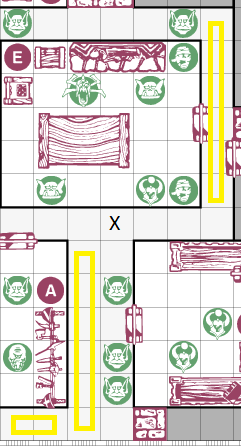 However, if the Elf has a crossbow, the Elf can not attack the corner mummies from the doorway because the Elf is not in the room and the mummies are not in the Elf’s line of sight. However, it is legal to door camp. Heroes can sit at the door and attack through the door using crossbows and spells. Meanwhile, virtually all monsters can only attack adjacent. 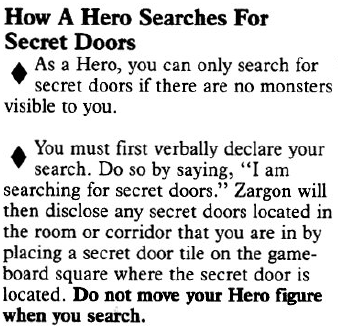 So Zargon ends up having to fight three against one at the door and hide monsters in the room corners. 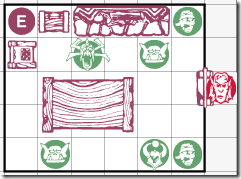 Other dungeon crawler board games avoid this scenario by having monsters spawn only after the heroes enter the room, or by giving monsters more powerful ranged weapons. 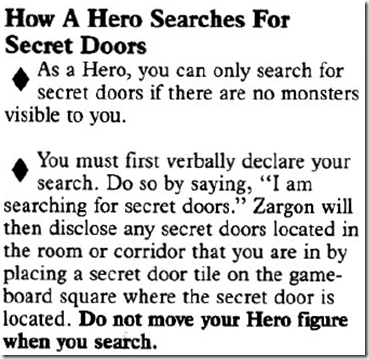 Overall, HeroQuest door camping is lame and awkward. I’m assuming the original game designers didn’t think it through, and I consider it a design mistake. An easy way to reduce the effectiveness of door camping is the following rule – you can not cast spells or do ranged attacks through a door. Melee attacks through a door are still fine. With this change, heroes could still door camp, but it wouldn’t be very effective. In most cases, Zargon would just wait. 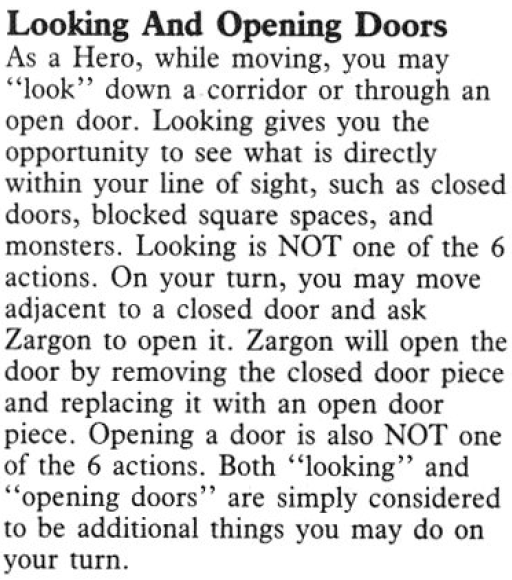 My HeroQuest implementation emphasizes the authenticity of nostalgia, but I’m still planning to include this anti-door-camping rule (I *might* include an option to disable the rule). 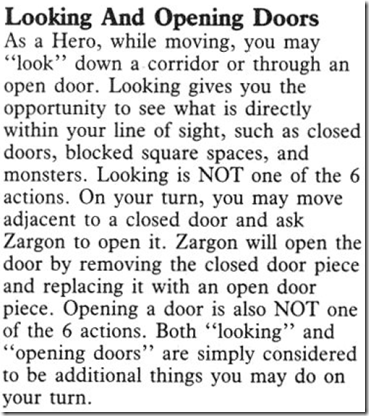 It may not be a literal translation of the original game rules, but it addresses the door camping design bug. The design bug was a mistake, so in a sense – the fix is more authentic than a literal interpretation. Revealing – open door (or pass through rock enter room) reveals entire room, line of sight for corridors (unobstructed by walls, closed doors). 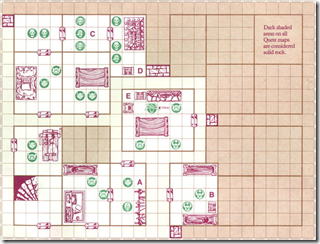 Search for treasure – current room only (no corridors). Search for traps or secret doors – current room only, corridors use line of sight (excludes rooms) (unobstructed by walls, closed doors). Line of sight means a straight line from your square center to the target square center. Revealing doors and searching for secret doors, use target square center (not wall middle) – so you can see doors at the end of a hallway even if they are on the side. Casting spells and Ranged attacking – target any monster/hero in your current room. For corridors, use line of sight (unobstructed by walls, closed doors). 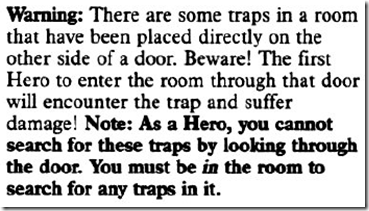 You cannot target a monster/hero in a different room – this is the anti-door-camping rule. One final detail is the question of whether heroes/monsters obstruct your ability to cast spells and ranged attack in a room and/or in corridor. For this issue, I’ve decided to use the European version (with the anti-door-camping tweak).